December 13, 2012 (LONDON) – Globally, health advances present most people with a devastating irony: avoid premature death but live longer and sicker. That’s one of the main findings from the Global Burden of Disease Study 2010 (GBD 2010), a collaborative project led by the Institute for Health Metrics and Evaluation (IHME) at the University of Washington. The findings are being announced at the Royal Society in London on Dec. 14 and published in The Lancet, the first time the journal has dedicated an entire triple issue to one study. The seven scientific papers and accompanying commentaries provide a new platform for assessing the world’s biggest health challenges, and then finding the best ways to address them. 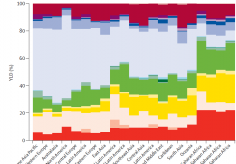 The study reveals massive shifts in health trends around the world since 1990, the starting point of the first Global Burden of Disease study. Since that time, the world has grown considerably older. Where infectious disease and childhood illnesses related to malnutrition were once the primary causes of death, now children in many parts of the world – outside of sub-Saharan Africa – are more likely to live into an unhealthy adulthood and suffer from eating too much food rather than too little. Lastly, health burden is increasingly defined by what’s making us sick rather than what’s killing us. The biggest contributor to the world’s health burden used to be premature mortality – driven by more than 10 million deaths in children under the age of 5 – but now the disease burden is caused mostly by chronic diseases and injuries such as musculoskeletal disorders, mental health conditions, and injuries. This burden intensifies as people live longer. Essentially, what ails you isn’t necessarily what kills you. While the world has done a tremendous job battling fatal illnesses – especially from infectious diseases – we are now living with more health problems that cause a lot of pain, impair our mobility, and prevent us from seeing, hearing, and thinking clearly. GBD 2010 started in 2007. IHME served as the coordinating center working with six other core collaborators: the University of Queensland, Harvard School of Public Health, the Johns Hopkins Bloomberg School of Public Health, the University of Tokyo, Imperial College London, and the World Health Organization. The researchers set out to completely overhaul the Global Burden of Disease process first created in the early 1990s by Dr. Murray and Dr. Alan Lopez, one of the founders of the Global Burden of Disease and Head of the School of Population Health at the University of Queensland. The project was initially funded by the World Bank. GBD 2010 grew to become a truly global effort. 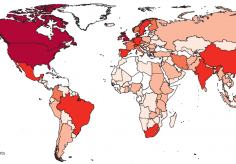 From 303 institutions and 50 countries, including 26 low- and middle-income countries, 488 authors have conducted the largest systematic scientific effort in history to quantify levels and trends in the world’s health problems. The work was funded by the Bill & Melinda Gates Foundation. First, researchers gathered more data than had ever been amassed for a health study. Using vital registration systems, surveys, censuses, and a meta-analysis of all available randomized controlled trials, they created a database covering everything from AIDS to zinc deficiency. They hammered out a set of criteria to determine which data should be included in the final analysis and which should not. If a study was not rigorous or was too specific to one place and one time to be broadly applicable, it was excluded. New analytical tools were developed to fill gaps in the data for countries where information is sparse. 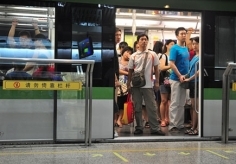 They tested those methods by using them to make estimates in areas where health data are more readily available, such as the United States or Japan. Ultimately, the GBD 2010 findings generated 650 million estimates for health challenges large and small. 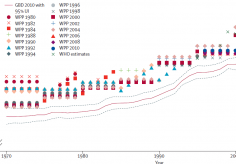 The study underscores significant achievements, such as the dramatic drop in child mortality, which has fallen so quickly that it has beaten every published prediction. But more work remains. Diseases such as diarrhea due to rotavirus and measles continue to kill more than 1 million children under the age of 5 every year, despite effective vaccines against those diseases. 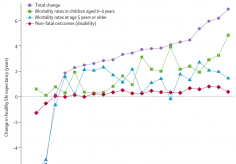 While child mortality has decreased, GBD 2010 found a startling 44% increase in the number of deaths among adults aged 15 to 49 between 1970 and 2010. This is in part because of increases in violence and the ongoing challenge of HIV/AIDS, which kills 1.5 million people annually. Another mixed success is that while the burden of malnutrition has successfully been cut by two-thirds, poor diets and physical inactivity are contributing to rising rates of obesity and other lifestyle-related risk factors, including high blood pressure, tobacco smoking, and harmful alcohol use. 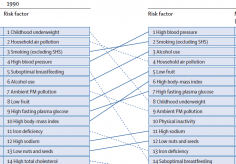 Dietary risk factors and physical inactivity collectively caused 10% of the disease burden, and the burden due to excess weight and high blood sugar are rising substantially. “We have gone from a world 20 years ago where people weren’t getting enough to eat to a world now where too much food and unhealthy food – even in developing countries – is making us sick,” said Dr. Majid Ezzati, Chair in Global Environmental Health at Imperial College London and one of the study’s lead authors. These findings are consistent with one of GBD 2010’s repeated themes: Disability is causing a greater and greater fraction of the burden of disease as demographics and epidemiology evolve. Much of this burden is caused by a relatively small group of ailments. 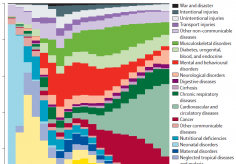 Researchers examined more than 300 diseases, injuries, and risk factors and found that just 50 distinct causes account for 78% of the global burden. Just 18 of those account for more than half the burden. “If we only could crack the code on just this small group of illnesses, we could make enormous progress in improving health,” said Dr. Kenji Shibuya, Chair of the Department of Global Health Policy at the University of Tokyo and one of GBD 2010’s lead authors. The types of illnesses and injuries causing death and disability are also changing. While ischemic heart disease and stroke remained the two greatest causes of death between 1990 and 2010, all the other rankings in the top 10 causes changed. Diseases such as diabetes, lung cancer, and chronic obstructive pulmonary disease moved up, and diarrhea, lower respiratory infections, and tuberculosis moved down. When looking at disease burden more broadly, taking into account both years of life lost due to premature death and years lived with disability, the changes have also been dramatic. Neonatal encephalopathy, an often fatal brain condition in newborns, fell out of the 10 leading causes between 1990 and 2010, as did protein-energy malnutrition, the leading cause of starvation. They were replaced by lower back pain and road injuries. The trends identified in GBD 2010 occur across regions with one notable exception: sub-Saharan Africa, where infectious diseases, childhood illnesses, and maternal causes of death account for as much as 70% of the burden of disease. By comparison, these conditions account for only one-third of the burden in south Asia and Oceania, and less than 20% in all other regions. Additionally, while the average age of death throughout Latin America, Asia, and north Africa increased by more than 25 years between 1970 and 2010, it rose by less than 10 years in most of sub-Saharan Africa. What have been historically considered “Western ailments” also menace millions in Africa, including the very young. Pain, anxiety, and depression – which erode quality of life and productivity – are ranked among the highest causes of years lived with disability throughout sub-Saharan Africa. GBD 2010 provides the evidence for a range of new research projects and targeted policymaking. It also opens the opportunity for countries to conduct detailed burden studies of their own populations. “GBD 2010 is an analytic undertaking of extraordinary scale and ambition. It provides the only truly comprehensive picture of human illness and death worldwide,” said Sir Richard Feachem, Director of the Global Health Group at the University of California, San Francisco, Global Health Sciences and the former Under Secretary General of the United Nations. “It will be of immense value to policymakers and public health practitioners in all countries. It will also generate heated debate, which will lead to further advances in data collection and analysis and better estimates in the future." Over two decades, the Global Burden of Disease project has driven powerful policy changes and health improvements worldwide. 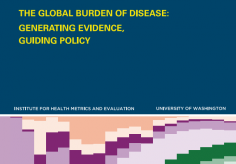 Following the GBD 1990 study, dozens of countries conducted their own disease burden studies and policy changes, including Mexico, France, Australia, and Iran. The findings from the first GBD study also brought malaria back to the world stage after years of neglect, spurring the rise in policy attention that has lowered deaths. Depression had not been framed as a public health problem until the 1990s when the original GBD study showed its significant burden. GBD 2010 promises to bring new attention to a broader range of illnesses and conditions having an impact on health worldwide and to help guide new target-setting exercises for health improvement. IHME organized a technical training workshop to train interested researchers and policymakers in the data, methods, findings, and implications of GBD 2010.